Pinkie Pom has been updated to version 1.4.0 with the addition of a new retro-style game mode, Classic Snake. The famous 90's snake game is simple to play, but challenging and addictive! Bring back memories and relive the nostalgia of Nokia Snake game. 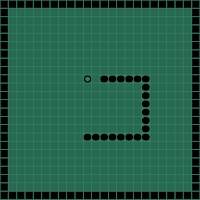 Play as pompom snake and control the direction of the head of the retro-styled snake (up, down, left, and right) and its body will follow. The pompom snake will keep moving and cannot stop, neither go in reverse. Eat the pieces of food to grow and avoid hitting walls or its own tail. After eating the food, its tail will grow longer and longer. Whenever the snake has eaten the food, another piece of food will appear somewhere in the play area. Get as much points as possible! 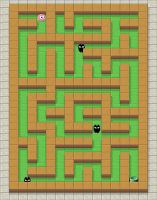 Pinkie Pom has been updated to version 1.3.0 with the addition of a new Garden Maze game mode, Hedge mazes. 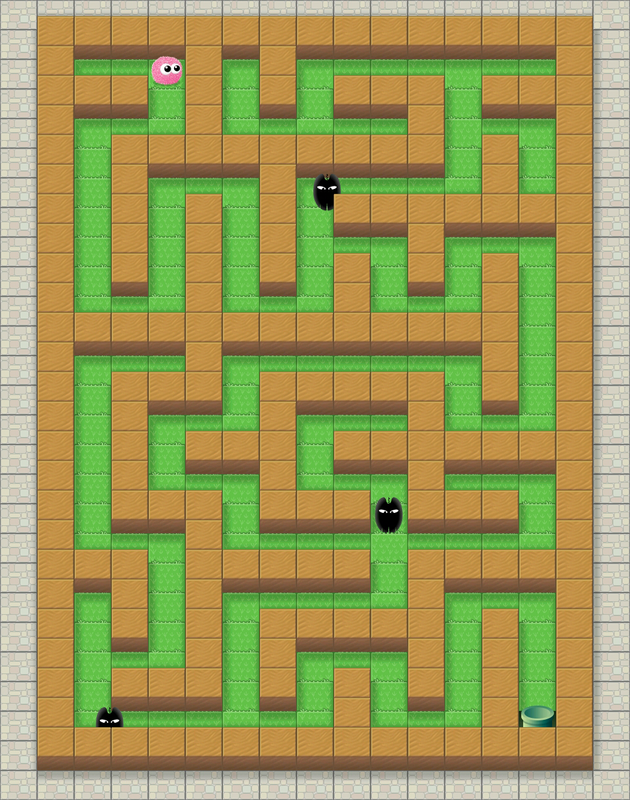 The maze puzzle has 64 levels to explore. It is simple to play, but challenging! Will you be able to survive the creeps and find the way through the labyrinth in 60 seconds? Please help the cute pinkie pom get to the end of the maze before time runs out to unlock the next adventure maze! 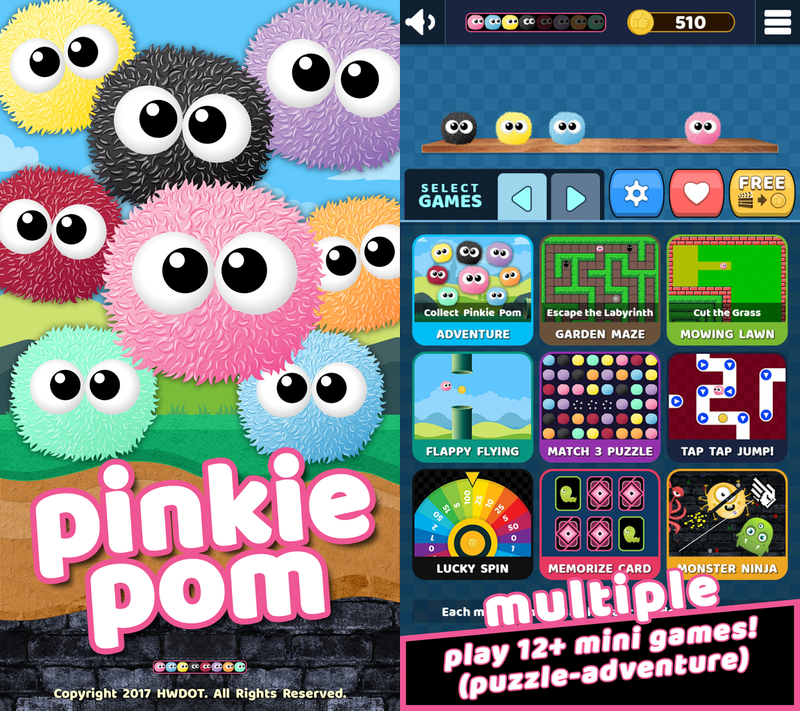 Pinkie Pom is a free-to-play game for Android-powered smartphones, available from HWDOT as a free download on Google Play. Pinkie Pom has a lot of game elements, including Adventure Mode, Garden Maze, Match-Three Puzzle Mode, Jigsaw Puzzles, Endless Flappy Flying game mode, Endless relaxing Card Memory game mode, and various things to unlock. There are many mini games inside Pinkie Pom that lets player enjoy playing, tapping, exploring, matching, flapping, flying, jumping, memorizing, solving, and multitasking. So are you still looking for a complete PomPom game? Play Pinkie Pom once and you'll want to play this challenging pom pom game more. Lots of fun! Pinkie Pom has been updated to version 1.1.0 with the addition of a new mini game mode, Flappy flying game. Player can now unlock an Endless Flappy Game Mode. The new game mode is unlockable after playing Adventure mode stage 5. 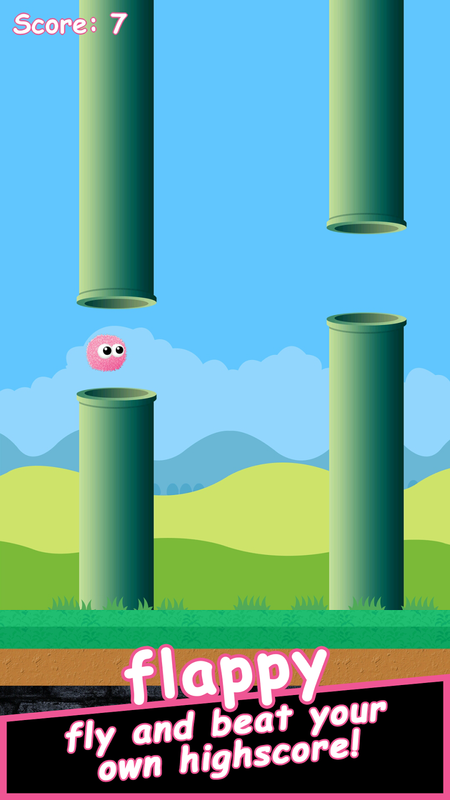 Tap the screen to flap and avoid deadly pipes. Help the pompom fly while avoiding obstacles, get as far as possible, and beat your own highscore. 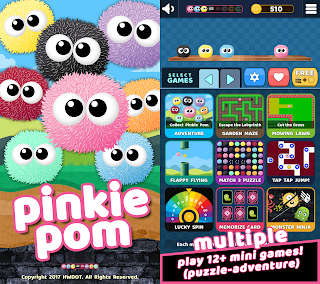 Pinkie Pom is a free-to-play game for Android-powered smartphones, available from HWDOT as a free download on Google Play. Pinkie Pom has a lot of game elements, including Adventure Mode, Match-Three Puzzle Mode, Endless Flappy Flying game mode, Endless relaxing Card Memory game mode, and various things to unlock. There are many mini games inside Pinkie Pom that lets player enjoy playing, tapping, matching, flapping, flying, jumping, memorizing, solving, and multitasking. So are you still looking for a complete PomPom game? Play Pinkie Pom once and you'll want to play this challenging pom pom game more. Lots of fun! 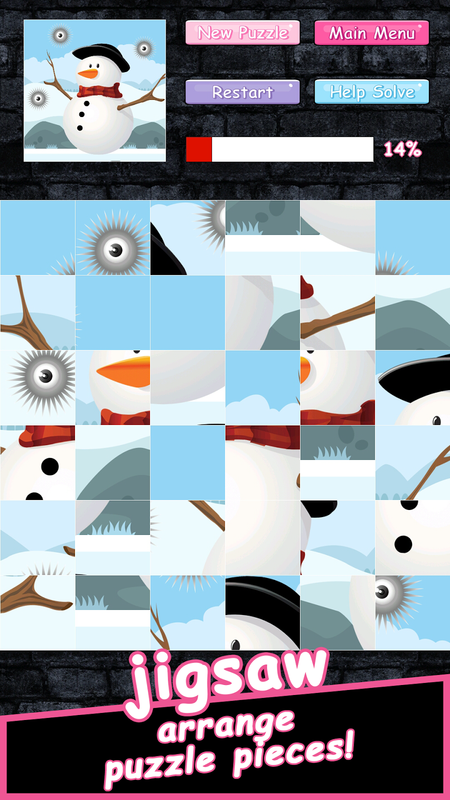 Pinkie Pom is a cute puzzle-adventure game for Android-powered smartphones. Pinkie Pom is a free-to-play mobile adventure + match-three puzzle + cards game. Loaded with all-new challenges, multiple levels, cute characters, and funny crazy monsters, Pinkie Pom is available now from HWDOT as a free download on Google Play. Pinkie Pom has a lot of game elements, including Adventure Mode, Match-Three Puzzle Mode, Endless relaxing Card Memory game mode, and various things to unlock. Adventure is the main game mode. The objective is to help Pinkie Pink, one of the eight Pinkie Poms finding the others missing. Travel the physics-world while meeting funny mysterious characters. But, players must beware; there are blockers in every stage that will potentially halt their advancement.